Smart Reply is now available in Gmail. 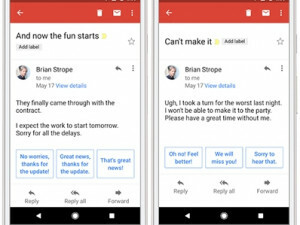 Google's e-mail app will soon suggest responses to e-mails, which will allow users to reply timeously and appropriately while on-the-go. The feature, called Smart Reply, uses artificial intelligence to scan through e-mails and give the option of three replies. It first appeared in 2015 in its separate e-mail app called Inbox, and has since been used in messaging app Allo and on Android Wear. Smart Reply will now be integrated into Google's mainstream e-mail smartphone app Gmail. This was announced at Google's annual I/O developer conference this week. Google says Smart Reply messages account for 12% of all replies sent in Inbox. "Based on our examination of the use of Smart Reply in Inbox and our ideas about how humans learn and use language, we have created a new version of Smart Reply for Gmail. This version increases the percentage of usable suggestions and is more algorithmically efficient," explain Google researchers Brian Strope and Ray Kurzweil, in a blogpost. Three basic suggestions will be given at the end of a message and users can either choose the best to send immediately, or edit one of the replies. Over time, Smart Reply will learn how users speak (or write) in e-mails, and responses will become more personalised. The update will roll out to iOS and Android in English. Google says a Spanish version will be available in the next few weeks.